Spam filters have come a long way since the early days of email. Once a relatively spotty service, email security has beefed up considerably over the past few years. While this is generally a good thing, it can spell trouble for legitimate email marketers. Even if you follow best practices, overactive spam filters can send your messages straight into digital purgatory. 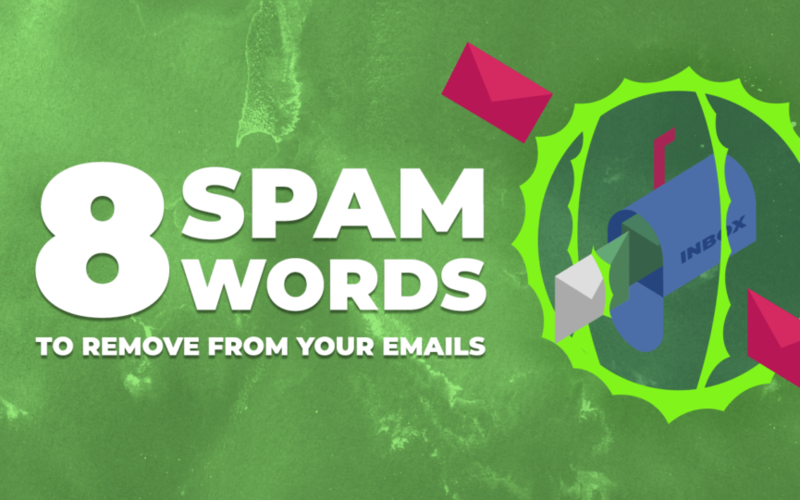 Although filters have changed rapidly, one of the first lines of defense for email security software remains the “keyword blacklist.” This is a list of words or short phrases commonly found in spam emails. To help make sure your messaging actually reaches the customer, here are 8 common words to avoid in email marketing. Incentives are often a key component of email marketing. Everyone likes getting something for free, so why is the word blacklisted? Unfortunately, this is a case where scammers have ruined a perfectly good word. Under the guise of a “free” product or service, trolls and unscrupulous marketers often use people’s personal information for nefarious purposes, from unwanted phone calls to identity theft. Instead of offering something “free” – try a word like “complimentary.” In some cases, the word is superfluous. For instance, there’s no need to offer a “free coupon” when you could simply offer a “coupon” – most coupons are free. This is not to say that a single use of “free” will immediately doom your message – but excessive use often will. Creativity is the lifeblood of a good marketing email. Often dull and monotonous, spicing up your email text with some interesting language is a great way to get people to pay attention to your messaging. However, misuse of the “$” sign is not a good way to go. For example, replacing the “S” in any word with a “$” sign is likely to be marked as spam. Think about it; if an email sender talked about “Big $avings,” how likely would you be to open it? However, even legitimate uses of “$” can spell trouble as well. If possible, avoid listing prices in emails. If you’re offering a discount, offer it in the form of a percentage instead of a direct dollar amount. If you must use a dollar amount, include the discount in your hero image, rather than in the text. This is another case where misuse of symbols can hurt you. Many spammers claim that their “service” is “#1” – don’t be like them. Not only are you likely overpromising, you’ll make your content look tacky. Try phrases like “industry leader” or “highly respected”. These sound much more professional, and are far less likely to trigger spam filters. This word has been sullied by a very particular kind of scam – fake “lottery” emails. To be clear – very few legitimate lotteries inform winners via email. This however, has not stopped scammers from swindling unsuspecting people via wire fraud. Think of those ads telling you “Congratulations – you’ve won a new Iphone.” If you’ve ever clicked on one, you understand why email filters might not love the term. If you’re legitimately congratulating a winner of a contest or sweepstakes, hopefully, you’ve taken more information from them than their email address. Contacting winners by mail or phone appears far more legitimate. If you must contact winners via email, make sure that users add you to their contact list, which will help ensure that your message reaches them. Similarly to “congratulations, this commonly used word is often misused by lottery scammers. Even if you’re not contacting a prize recipient, phrases like “this product is a real winner” or “feel like a winner” are unhelpful for getting your message to consumers. As with “congratulations,” it’s best not to contact winners of any variety by email. Outside of this use, most of the non-sweepstakes phrases associated with this word are easily avoidable. Simply be careful with your word choice, and this word is easy to nix from your campaigns. We talk a lot about urgency on the UpSellit blog; it’s an effective sales tool that’s been around for centuries. However, using the word “urgent” is not only on the nose – it’s also been corrupted by spam emails. If you’re like me, you’ve gotten many “urgent” spam messages – “offers” from dying dowagers, Nigerian princes, etc. There are many ways to communicate urgency without saying “urgent.” Alternatives like “this offer expires soon” – or even “hurry” – are far less likely to get your message sent to spam. Often, use of this word is well intentioned. Many email marketers, in an attempt to build trust, say they’ll “never spam you” or that they “hate spam too”. While this is a nice thought, it’s ironically an excellent way to be marked as spam. In these cases, it’s best to elaborate on what you won’t do. Phrases like “we promise to never sell your information” or “your privacy is important to us” are far more effective. Having your messages sent to the spam folder is like throwing money away – you’re literally reaching no one. Although avoiding spam filters is more complicated than word choice, certain words can make or break your message’s journey no matter how legitimate. By using alternatives, you can better ensure that your messaging reaches your consumers.